“Hello chinese fans! Got this award..Thank for your support all the time. Will meet you this year if I have the chance. Damn this politics, separating the fans from their idol, making them unable to share each other’s happiness. I’ve heard it said that blue jeans and the Beatles…aka rock and roll…brought down the Iron Curtain. When the Russian youth couldn’t get either one….down came the Berlin Wall. Anyone remember Tiananmen Square? 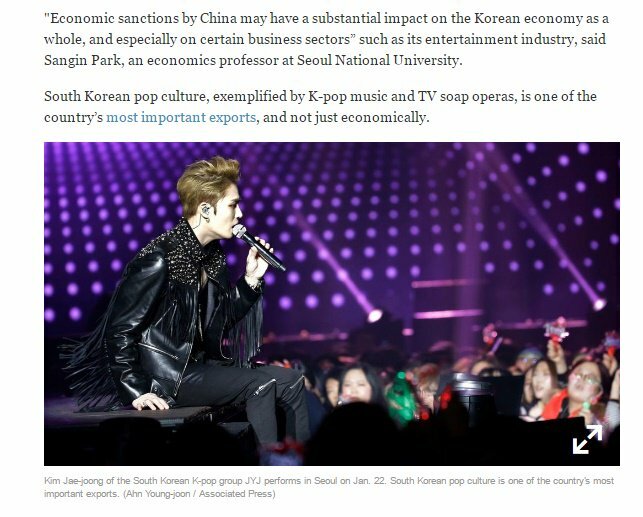 It could happen again when Chinese youth can’t get their Kpop stars ! It was recorded prior to award show. You can go check cjes instagram.There is a photo of jaejoong recording something in same outfit about 6days ago.They just didn’t show it because the award show was full of sm artists.I personally think sm must have requested them not to show it. Does this mean only SM artists are exempt from the ban on South Korean performers? If so, that means SM is already doing their evil deeds in China. ds names doesn’t even make sense.3 exo members get the most popular artist award. I mean how can there be 3 most popular artists? It was just a made up show.just a sm party. That’s what most people were saying, an SME party but the blacklisted Jaejoong was able to gatecrash, they didn’t show his video but they couldn’t afford to erase his name as an awardee 🤣BEST MALE ARTIST (KOREA) . Yeah. They had to give him an award at least because his mv got a 100 and 4record breakings. He got it with popular points alone without fan votes.Even his chinese fans are surprised. Our Jaejoong is really badass. Are Chinese fans not allowed to buy the product of Korean artists? How extensive is the ban on K-Pop there, does anyone know? No idea. There is ban in China ? Yes. Just recently instituted apparently. That is the reason why Jaejoong didn’t go to China on his Asia Tour? This is why Jaejoong had concerts in HK and Macau only, and YYT awarding ceremony was held in Macau instead at mainland usually at Beijing . Was it just in random that they used Jaejoong’s pic? Of course. Jaejoong is the penultimate example of great Korean pop music. It’s just a shame that the powers-that-be there allow a single entertainment company to totally blacklist him in his own country when he is so beloved around the world. People could spend their time doing a whole lot worse! I’m still going through videos and some for the fifth time! Just found in iTunes Jae singing Crying! And another one 발 걸 음. That is very familiar, but I can’t place it! Yeah , JJ’s pic. Politics are always there to interfere. Sad news. Our BOSS is on the headlines, there are a lot of news articles (posted in twitter), let’s click the links and give 💗s and share, let’s promote the BEST ARTIST KIM JAEJOONG !!! Who said Jaejoong laid down his torch when he enlisted, he never did, in fact his torch was shining even brighter than the rest. This YYT award is just a following of the honor he received last month, all were from the period when he was an active soldier. Kim Jaejoong’s “No. X” nabbed the said honor given the high scores and positive reviews that it received from various Chinese media reviews. Moreover, Jaejoong was the only solo musician that made it to Youku’s Top 10 list. Launched in February 2016, “No. X” became one of the most successful albums in South Korea during the first half of the said year. It even rose to the top of the iTunes album charts in 39 countries during its debut. 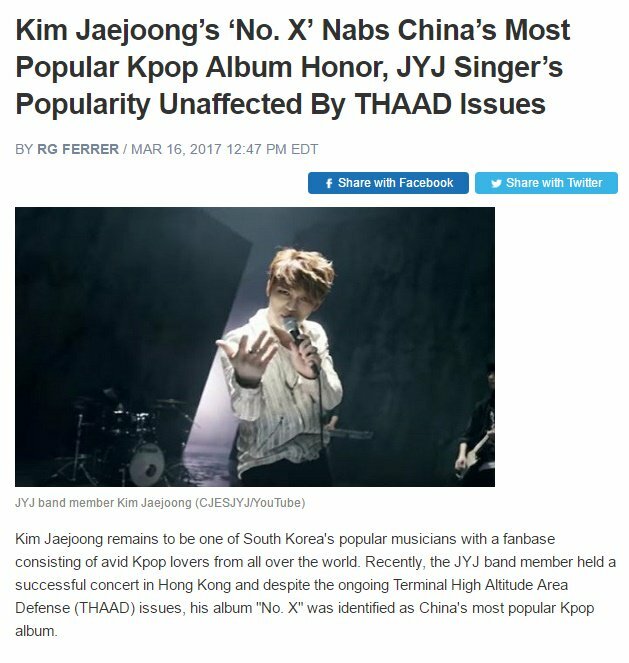 The said album was also a memorable treat for the fans since it was released while Kim Jaejoong was completing his mandatory military service.